Lawrence of Berkley and I had a little shooting expedition last weekend. I was testing the new AF-S NIKKOR 24-70mm f/2.8G ED and he the new, used D700. The start of the trip was the Lapeer Depot where we shot whatever we could before the one freight train we saw all day blew by at high speed. 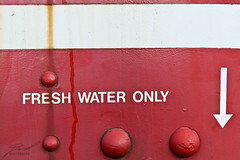 This was a notation on a caboose (there are three at the depot) which caught my eye. I was thrilled with the close focusing performance of this lens.